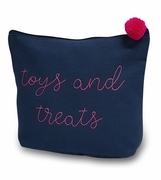 This classy accessory bag makes a great going-away gift for a friend or family member. They can use it on their travels and always be reminded of loved ones waiting for their return back home. The bag has a classic, simple pouch design with one compartment and a zipper closure along the top. The elegant look features horizontal pink and white stripes. It has the words ‘Bon Voyage’ written in fun, black lettering on the front panel. A fluffy blue pom-pom attaches to the zipper pull, finishing off the feminine look. 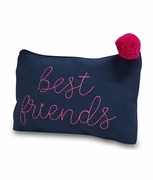 This functional and thoughtful cosmetic bag is neat and compact and can be slipped into a tote, travel bag or weekender duffel.